In stock -This product will ship today if ordered within the next 4 hours and 28 minutes. When you notice the fragrance from your Dryer Eggs less, it is time to replace your Dryer Egg fragrance sticks. Simply remove the old fragrance stick from your eggs and replace with your new sticks. Contains four replacement essential oil infused fragrance sticks. Each fragrance stick will provide long-lasting fragrance for your clothes for approximately 20 dries. With two Dryer Eggs being required, and four sticks in the kit, the refill pack will last you a further 40 dries. As part of Ecoegg`s promise to be kinder to the environment, we have made improvements to our Ecoegg Laundry Egg packaging. All cardboard is FSC certified and 100% recyclable, and the ink is all vegetable based so 100% biodegradable. Also available in Fresh Linen. Ecoegg Dryer Egg fragrance sticks contain glycerol monostearate and perfume. Simply place the Ecoegg dryer eggs into the drum of your tumble dryer and dry your laundry as normal. It`s the clever way to dry. 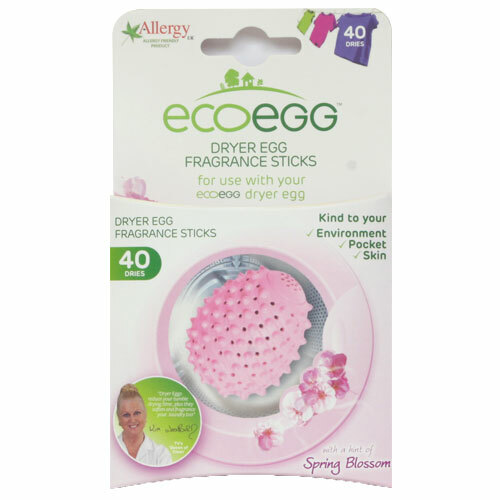 Below are reviews of Ecoegg Dryer Egg Fragrance Sticks Spring Blossom - 40 Uses by bodykind customers. If you have tried this product we'd love to hear what you think so please leave a review. Nice product with a great perfume.